Ireland has just voted in a referendum to repeal one of the world's strictest bans on abortion. Previously, abortion was illegal unless in the context of a medical emergency to save the mother's life. Andorra; Malta; San Marino; Angola; Congo-Brazzaville; Congo-Kinshasa; Egypt; Gabon; Guinea-Bissau; Madagascar; Mauritania; São Tomé & Príncipe; Senegal; Iraq; Laos; Marshall Islands; Micronesia; Palau; Philippines; Tonga; Dominican Republic; El Salvador; Haiti; Honduras; Nicaragua; and Suriname. The Center for Reproductive Rights' World Abortion Laws Map 2018 shows the legal situation across the globe. A further 37 countries ban abortion unless it is necessary to save the life of the woman. These include major economies such as Brazil, Mexico, Nigeria, Indonesia and the UAE. A further 36 countries restrict access unless an abortion is necessary to protect the woman’s physical health. These include three European countries - Poland, Lichtenstein and Monaco - as well as South Korea, Jordan, Argentina and Costa Rica. A further 24 countries include protecting the woman’s mental health as grounds for access. These include New Zealand, Israel, Malaysia, Colombia and Thailand. Overall, only 37% of the world’s 1.64 billion women of reproductive age live in countries where abortion is permitted without restriction. 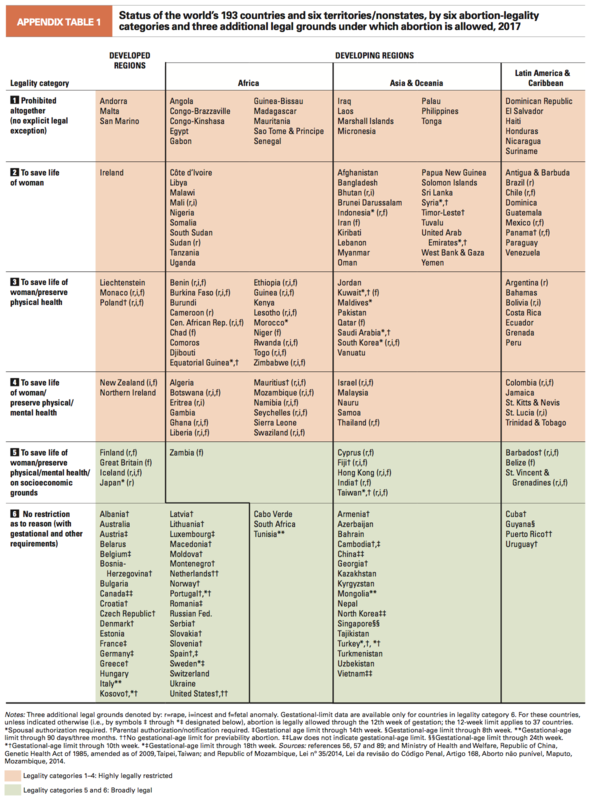 Thirteen countries, including Great Britain, India, Finland, Japan and Taiwan, include socio-economic reasons as grounds for permitting an abortion. 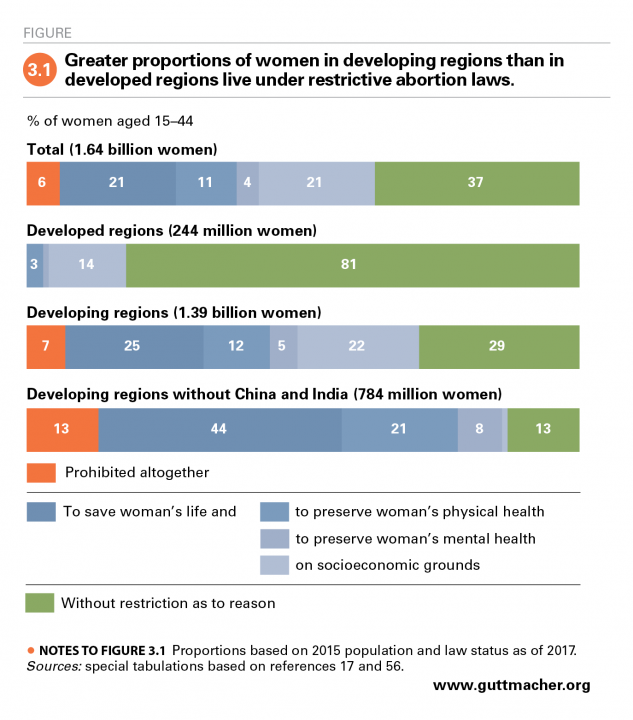 Sixty one countries do not restrict access to abortion. The vast majority of countries with very restrictive laws are in developing regions. In contrast, nearly all of Europe and North America, as well as several countries in Asia, have broadly liberal abortion laws. However, a liberal law does not necessarily guarantee safe access. India permits abortion, but factors including inadequate public sector facilities, onerous regulation on private sector clinics, poor understanding of the law and stigma mean that an estimated 78% of abortions take place outside a health clinic, most of them illegally. Every year, at least 23,000 women die from unsafe abortions, the Guttmacher Institute estimates. Seventeen million unsafe procedures take place, according to a report in The Lancet. In Latin America, three-quarters of all abortions are illegal. Over the last 20 years, more than 35 countries have expanded safe access to abortion. But three countries in Central America - Honduras, El Salvador and Nicaragua - have tightened restrictions. Over the same period, democracy in these three states has weakened, argues Professor Larissa Arroyo Navarrete, suggesting a link between the lack of rule of law in a country, and threats to its women's rights. In El Salvador, where abortion is totally banned, authorities can prosecute women whose pregnancies end before 40 weeks, even if by miscarriage or stillbirth, if they are suspected of harming their fetus. Prison sentences range from two to eight years, though some women have been convicted on charges of aggravated homicide and sentenced for up to 30 years. El Salvador also defied calls from the UN to relax its abortion laws throughout the Zika virus crisis. The mosquito-borne Zika virus is linked to congenital abnormalities, including microcephaly, in babies born to mothers who contracted the virus. The Irish referendum vote reflected a generational divide, with younger voters opting to change the law while a majority of those over the age of 65 wanted to keep the eighth amendment, which protects the right of the unborn child.